On Christmas morning of 2010, Misty gave birth to a beautiful baby boy, Gabriel. It was soon after Gabriel’s arrival that Misty’s deteriorating motor function and increasing weakness became apparent. In March of 2011, she was admitted to Lyndon B.Johnson General Hospital in Houston, into the neurology unit. One week later, the doctors returned with the diagnosis of Motor Neuron Disease/probable Amyotrophic Lateral Sclerosis (ALS). Further testing would later confirm the diagnosis of ALS. In the months since Misty’s diagnosis, her motor function has deteriorated at a very rapid rate. While we take for granted our abilities to perform simple daily tasks, like washing and brushing our hair or brushing our teeth, Misty longs for the ability to just be able to walk over to and pick up or hold her young son, Gabriel, when he cries. 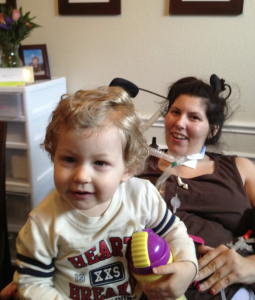 In January of 2012 Misty was placed on a ventilator and feeding tube. On July 6, 2012, surrounded by her family and friends, Misty passed away. She will be greatly missed.